The Mega Man Legacy Collection is a "faithful reproduction" of the original six Mega Man games, spiffed up with a hi-def paint job, two new modes of play, and leaderboards with integrated video replays. 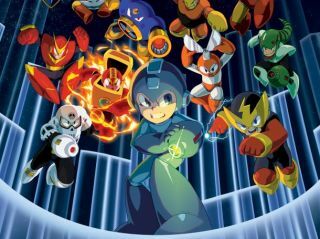 The bundle is being developed by Digital Eclipse and will be built on its Eclipse Engine, which "rebuilds the original games from their source elements," Capcom explained. "The result is a sharp, clean picture that proudly displays these iconic sprites in lovely 1080p, and presents the games as they existed in their original forms." The six games will be playable as they always have been, but the Legacy Collection also adds a new "Challenge Mode" of increasingly difficult trials created from mixed segments of gameplay taken from all six games, and "Museum Mode," featuring "a massive repository of history and art collected from the era," including hi-res official art, concept pieces, and sketches, all scanned at "absurdly high resolutions to make them as clean and clear as possible." The Mega Man Legacy Collection will be released digitally later this summer, and will go for $15.